Tayler, Chris, and Britni Sabella with Cheryl Opper at a spring fund-raiser for School on Wheels. A year ago, Chris Sabella’s mobile home in Rockland was foreclosed on. He’d been laid off from his job at a maintenance company, his unemployment benefits ran out, he couldn’t find a job, and when his car broke down, he couldn’t afford to fix it. “Rockland has no public transportation,’’ says Sabella, “and it was a four-mile walk to the grocery store.’’ Sabella is a single father; his daughters are 10 and 15. The state Department of Transitional Assistance placed them for a few nights in a motel, then at Evelyn House, a family shelter in Stoughton run by Father Bill’s & MainSpring. Their first week at the shelter, Sabella was feeling down. He had no money or car, and the school year was about to start. The girls needed supplies. And to tell the truth, they could use some help with their studies. Then Cheryl Opper approached him: Would he like her organization, School on Wheels, to tutor the girls a couple of times a week? It was, Sabella says, a lifesaver. “They provided backpacks, notebooks, calculators, binders, everything the girls needed,’’ he says. They paid for field trips and school photos. And when Tayler’s homecoming dance approached, School on Wheels bought her a dress so she could attend. Sabella finally got a job with a printing company in Brockton and the family moved into a subsidized apartment there in March. “It’s a good job, I’m very happy about it, and we have a beautiful home,’’ he says. School on Wheels provided them a laptop computer and printer for the girls’ school work. Still, Britni and Tayler needed to finish out the year in their own schools, and Sabella had no car. School on Wheels arranged to send a cab for them each morning and to deliver them home at the end of each day. Britni was enrolled in school in Rockland; Tayler was at South Shore Vocational Technical High School in Hanover. Sabella eventually was able to buy a car, and life is looking brighter. The family remains grateful to Opper, who founded the nonprofit five years ago. Its mission is to help educate homeless children with tutoring and mentoring, school supplies, parent workshops, and summer enrichment programs. The organization receives no state or federal funding; it raises money from foundations, business and civic groups, schools, churches, and individuals. In the past year, its services tripled. In 2007-2008, it gave out 150 backpacks full of supplies; last year, it was 625 backpacks. School on Wheels now goes into seven shelters, four of them on the South Shore. In the fall, it will go into two more shelters, in Norwood and Attleboro. In Brockton, which has about 100 families living in motels awaiting shelter space, the agency has set up tutoring services on site. Opper, a former kindergarten teacher who lives in Easton, started the organization after reading an article that made her think about homeless children and education. “There are invisible children in our classrooms, and we really need to be their voice,’’ she says. According to Opper, about 10,500 families a year become homeless in Massachusetts; the average age of the child is 8, and families stay in shelters an average of six to nine months before finding permanent housing. School on Wheels workers found one high school senior living in a men’s shelter, trying to get his diploma. The boy needed transportation home from his sports practices, help with school fees and the senior prom. But most of all, he wanted a tutor to help him prepare for college. “What impressed us most was his positive attitude and his desire to have tutoring four days a week,’’ says Opper. When he was accepted at Newbury College, a staffer from School on Wheels accompanied him to the school to help him fill out housing forms and meet with the financial aid office. 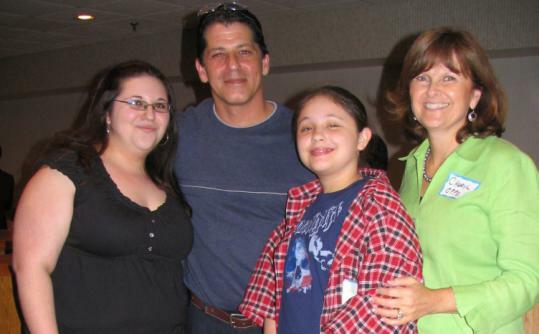 As for the Sabella family, Chris and his girls are showing their gratitude in a number of ways. Britni and Tayler are packing supplies into backpacks. Tayler will soon start tutor training, so that she can work with homeless children in the fall. And she and her father are the newest members of the School on Wheels advisory council. For more information about School on Wheels, go to www.sowma.org. Globe columnist Bella English, who lives in Milton, can be reached at english@globe.com.